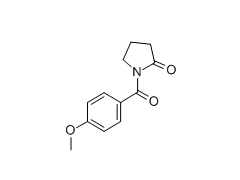 Aniracetam (Draganon, Sarpul, Ampamet, Memodrin, Referan), also known as N-anisoyl-2-pyrrolidinone, is an ampakine nootropic of the racetam chemical class purported to be considerably more potent than piracetam. It is lipid-soluble and has possible cognition-enhancing effects. It has been tested in animals extensively, Alzheimer's patients, and temporarily impaired healthy subjects. It has shown potential as an anxiolytic in three clinical animal models.